Some people think that a brand and a logo are synonymous , and we can certainly see why. A logo is often the first thing you think about a brand and it should encapsulate all the brand qualities – think of Nike and try not to picture the swoosh. But the truth is the logo design is just one element of a brand – albeit a very important one. Logo design should be part of a wider branding process that takes into account the relevant industry, the target clients and the individual qualities of the business. As logo designers it’s our job to integrate all these aspects into a design that is timeless, professional and perfectly aesthetically suited to the business. At BA Creative, we understand the importance of the the logo design stage in the overall branding process and how it needs to be a collaboration with our client. It is possible to have a logo designed on the other side of the world by someone that you’ll never meet but we don’t work that way and never will. Our clients can come and meet our team of talented designers face to face in our East Brisbane studio, which means communication and the sharing of ideas is easy, natural and enjoyable. We believe that having one company look after your branding (including logo design), website design and digital marketing ensures every design that is created is integral to your entire range of marketing collateral and that everything looks fantastic in print and digital formats. Ok, let’s take a look at some of the logos we have created for Brisbane businesses – below are some examples. As always we started this project by having a good hard look at the existing AustStar brand. 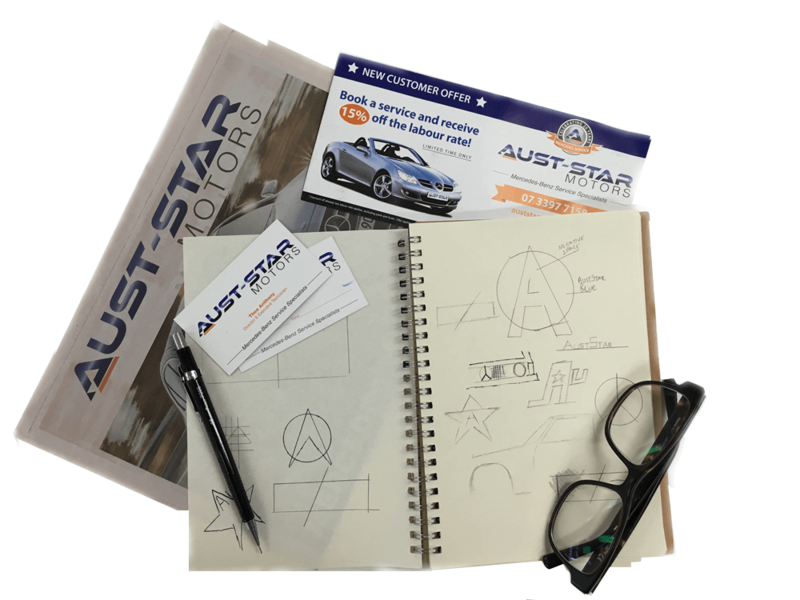 Over the years there had been several attempts at creating a good, strong brand image for AustStar, but, in our opinion, the attempts always came up short. 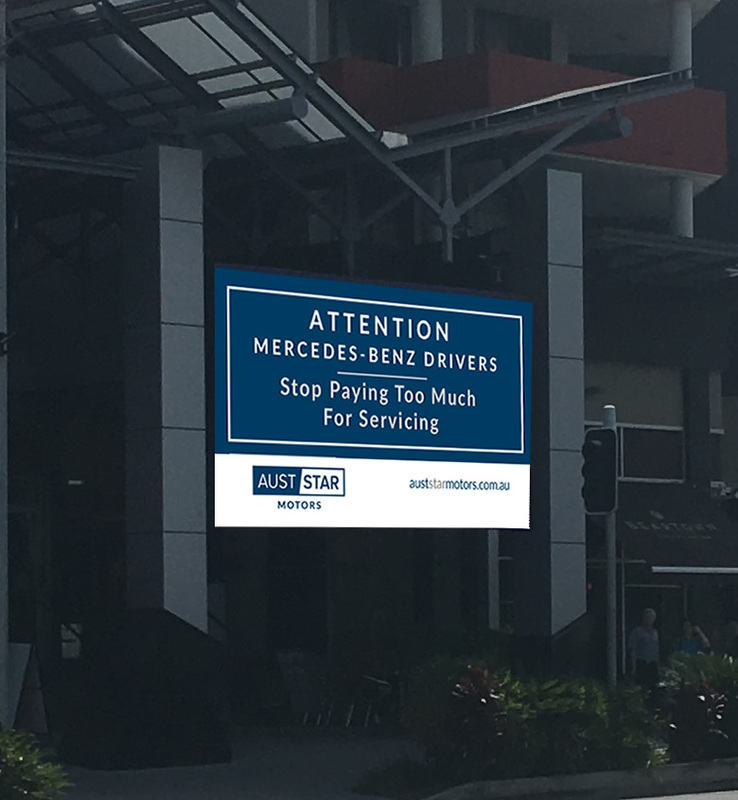 Just before BA Creative took over AustStar was projecting an image more suitable for an ’80s sci-fi movie than a professional business specialising in servicing high-end automobiles. You can see our point, can’t you? 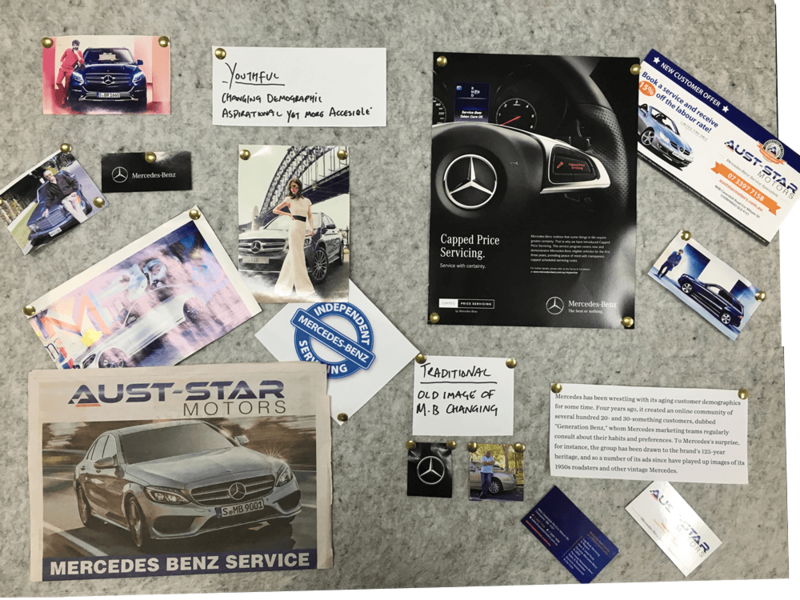 The question we asked ourselves is would someone looking for an alternative option for servicing of their beloved Mercedes-Benz choose a company with such an out of date and, well, gaudy image? We thought not. We started with a completely clean sheet of paper – the only thing that was locked in was the name, everything else was on the table. 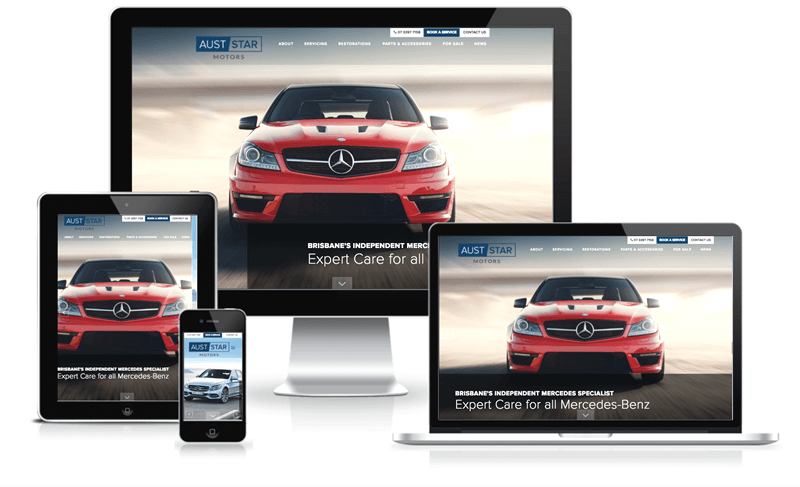 We researched who AustStar Motors’ clients were and focused in on the target demographic, the competition and other brands that filled the same market position. Ideas began to formulate and sketches were drawn. Next a moodboard was created. And from this the new brand was created. Then the design work begins in earnest and the new logo is created. Once the logo, colours and typography was locked in we moved on to deploying the brand. This included a multitude of applications from business cards, billbords ads and flyers through to a fantastic, fully responsive WordPress website. A brand evolution rather than revolution was the order of the day here. We needed to create a new logo that updated and freshened up the brand rather than reinvented it. You can see how the reflections and gradients allied with the futuristic font choice combine to create an image more suited to a technology firm – a dated one at that – rather than a bespoke construction business. It looked like an off-the-shelf logo and it had to go! Our new branding elements were designed to appeal to the target demographic. We wanted to make sure that anyone in the market for a new home or a major renovation would be encouraged and excited by GreenCube’s brand. We also wanted to create something that will have considerably greater longevity than the old logo. We like the idea of the new brand still looking good in years to come. Did we succeed? Judge for yourself below. As well as creating the new logo we also created a brand guidelines document that outlines the typography styles, colours and how the logo should be used.